Free Coupon Class in Philadelphia and Kennett Square. Ready to learn couponing or get encouragement? Get access to the best coupons and meet people locally to coupon with. 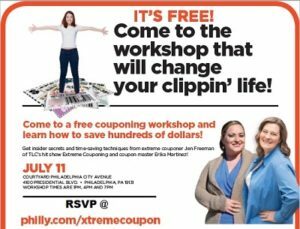 You will find everything you need at the free Philadelphia Extreme Coupon Class. RSVP by Clicking here — or jot the address down and come on out — no one will be turned away. 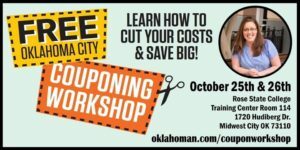 Meet Jen Freeman from TLC’s Extreme Couponing show in person and Coupon Master Erika is an expert to saving with coupons and more! See you there! This is a rather old video Mr. Cameraman and I did, but I am resurrecting it because it shows how I do most of my shopping. My shopping trips tend to be the polar-opposite of my TLC Extreme Couponing TV shopping trips, they are small in size but extreme in savings. =$1.58 OOP ~the extreme savings! If I was to do another TLC Extreme Couponing show, this is the kind of shopping trip I would love to do! This is Extreme Couponing — save a ton of money using coupons and the current sales and deals to shop free! This video taken during the General Mills buy 5 save $5 catalina deal shows how I went shopping and rolled one savings catalina deal into another (also know as “rolling’) to keep savings moving forward. This video was taken during my grocery shopping trip at my local Smith’s store in Vegas. When you see these deals try “rolling” them and get the giant savings. If you don’t need some of these items that are included, maybe you can pick some up and donate them or share with a family in your area that you know needs some help. Learn about the coupon lingo and couponing 101. 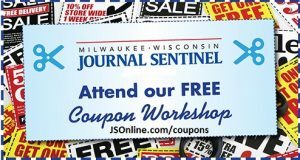 Milwaukee Free Extreme Couponing Classes! Meet Jen Freeman in Milwaukee at the FREE Extreme Coupon class. It’s time to learn how to save your family hundreds of dollars every single month. Get all the tips and tricks I used on my shopping trips on TLC’s Extreme Couponing show. 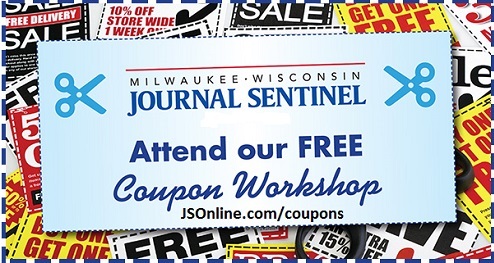 Jen Morris and I will be in Milwaukee for 3 days to teach the free extreme coupon workshop so you can easily save money on your household grocery store shopping trips. Learn to save 50% at the grocery store after hearing our tried and true secrets to successful shopping beating the stores at their own game! Watch the interview on the Milwaukee News and how Gail and Bonnie from Milwaukee saved over 50% after taking the class! A-M-A-Z-I-N-G! Share this link with your friends and we will see at the Milwaukee Extreme Couponing Events!